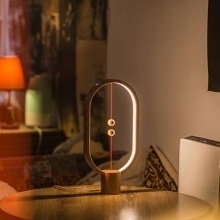 Are you seeking for a unique LED desk lamp which not only provides you good illumination but also decorate your home beautiful and attractive? Here is your ideal choice. Compact design, simple, elegant and minimalist, perfect decoration. Magnetic control way for turning on/off, easy to handle, new way to enjoy brighter life. 48pcs superb LED beads, flicker-free and anti-glare light without strobes and radiation, it can keep your eyes away from exhaustion. Excellent for college and university students who need suitable lights for reading and studying or wants to bring it with you and it is good decoration for living room, bedroom, restaurant etc.